This past Wednesday after Maggie was done with her morning therapy we loaded up the car and headed south. We were on the road a little after noon and we drove south, first heading out of Michigan and across Indiana and to the very bottom of Illinois where we found a little hotel in the middle of nowhere (there was no town and had been no towns on the road for a very long time) and stopped for the night. Bright and early the next morning we headed out again and drove through Missouri, spent most of the day crossing Arkansas, and finally in the late afternoon headed into Texas. By dinner time we had made it to the hotel where our family and friends were staying while we celebrated my sister's wedding. And going to the Rainforest Cafe for lunch. I have to add here that they were amazing about the kids' allergies. The head chef came out and talked with us about what were the best dishes that could be made without anyone having a reaction and all of the kids loved their specially made meals. It's really the best dining our experience we've had with allergies in the last three years. We spent a lot of time in the hotel pool. And amazingly Maggie was actually very, very cautious. She would wade in to her armpits and stop and go back to the shallow end. I still wouldn't trust her around water on her own, and I'm still really nervous about natural bodies of water since she seems to think she'll turn into a mermaid if she plunges in, but this made me slightly less nervous about pools while we're with her. On our first full day there we stopped by to visit with my sister in the midst of wedding preparations and she gave us each one of these bracelets. On the outside of the bracelet is a quote from my nephew's notebook(he passed away in a car accident during those winter storms, this last year shortly after the engagement was announced). The rehearsal dinner was so much fun. And Paul and I got our first picture with just the two of us in it in... years, I think. Patch refuses to sleep in beds at hotels. I'm pretty sure he's caught on to my nervousness (that Maggie is going to get out the door during the night) at hotels where the doors aren't easy to secure (if the deadbolts are too low and Maggie can reach them) and so even in rooms like the one we stayed in when we were in Texas where the deadbolts are high enough he refuses to leave his post. After putting him in many beds only to have him return to the hallway I've finally started making him little beds in the place he insists on sleeping. The next day we took the kids over to the Fort Worth Stockyards. Paul was certain I'd gotten us lost on our way there, but we made it. Then it was time for the wedding. It was beautiful! One person wasn't on board with being well behaved. I let him hold my (silent) phone to try to keep him appeased. He may have thrown it into the front row, barely missing the groom's parents. I don't think I've ever seen such fun pictures after a wedding! 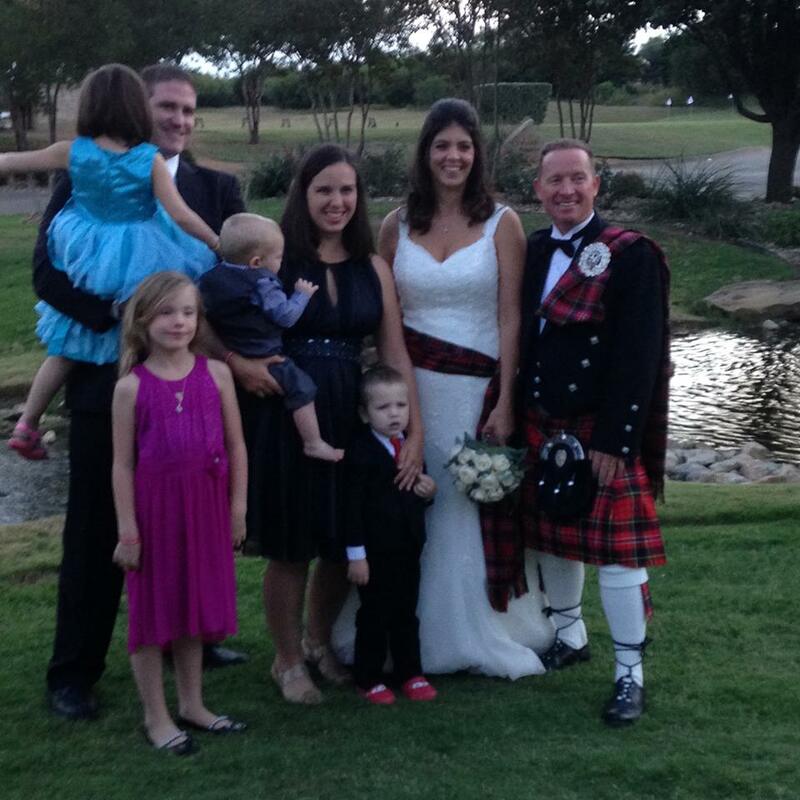 And the fact that the groomsmen and ushers wore kilts was awesome. Grumpy baby wasn't the one being grumpy. This picture should have given me an idea of who was going to be our grumpy kid at the reception. Because Patch fell asleep just before the wedding and when he woke up he was not in the happiest of moods. Maggie, on the other hand, had a blast. I think she ate at least thirty strawberries. And the biggest of the cousins got to meet the littlest. The next day we were back on the road. After a little hamming it up at lunch. It was a long drive up through Texas and across Oklahoma. We drove a mile into Kansas, because it's one of the only states I hadn't been to (it's now checked off the list!). The first night we stopped in Springfield, Missouri. The next day we made the rest of the drive across Missouri, and Illinois and Indiana. By bedtime we were home. It was a fun weekend, but it's good to be getting back into the routine of things! Although I do hope we make it to Texas more often. It was so much fun to see everyone and I'm so happy for my sister and her husband! What a wonderful wedding weekend! What a great trip! I am so impressed that you cut your hair with safety scissors and it looks that good! When I travel alone, I use a doorstop inside the hotel room for extra security. Maybe try that for extra piece of mind? You could wedge it in the door when Maggie's not looking. I got mine for a couple bucks at Target.